Yesterday was our first day of school. August 1st is typically my target date each year. I'm usually the one who needs to get back on a schedule with my kids. But this year, it was my daughter who wanted to hurry up and start while I dragged my feet enjoying the lack of schedule and the lazy mornings at home. Every year when we start school, I try to make it special for my kids. The first day is a celebration of all that they've accomplished and the new journey upon which they are about to embark. I think this is an important ritual for all families, not just those who homeschool. There are many ways to celebrate the first day. All over social media, I see people sharing pictures of their children holding up signs that proclaim what grade they are starting. This is, of course, the most common way that families kick off the school year. Others have special breakfasts or buy new outfits. There isn't a right or wrong way. The point is to make it special for your kids, get them excited about themselves and motivate them to learn. The way we celebrate the first day of school is simple. I always take time to pick up a few gifts for my kids. 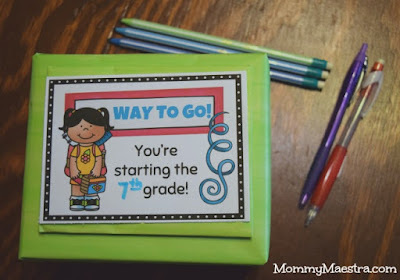 I prefer to give them items that they can use in school or that promote learning in a fun way. This might be unusual school supplies that they'll love using in school, or it might be a fun (board) game, books I know they'll love, or even gift cards. I take the time to wrap them up in gift wrap to add a little excitement to the moment. I don't go overboard crazy, just one or two things to make the day start off on a happy note. This year, I designed a few labels to place on top of my kids' gifts. And then I thought, I bet some MommyMaestra readers might enjoy these, too. So here you go. I hope you'll enjoy. 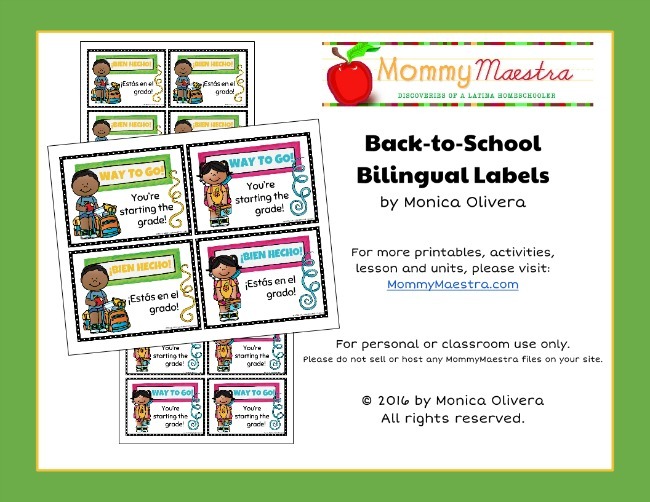 And if you are looking for more bilingual Back-to-School printables, be sure to check out my TpT store. You'll find new puzzle cards, tracing activities, and money worksheets - all with a Back-to-School theme, and all of them available in English and Spanish. Psst! Now is a great time to stock up on materials for the school year because TpT is having a sitewide sale. Don't forget that I have excellent materials for Hispanic Heritage Month, Día de los Muertos, and so much more! But you'll have to act fast because the sale ends tonight at midnight.